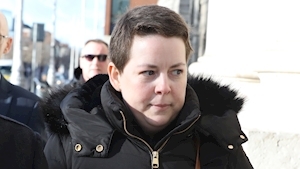 Cervical Check programmer manager John Gleeson has told the High Court open disclosure requires an adverse event, and the upgrading of the results of Ruth Morrissey’s smear slides from negative was not considered an adverse incident. Asked if the Vicky Phelan case never happened, when would the Limerick mother who now has at maximum two years to live have found out about the audit reviews on her smear slides, Mr Gleeson said: “If she had chosen to ask us”. Mr Gleeson who was subpoenaed by the young mother’s legal team was giving evidence in Ms Morrissey’s case against the HSE and two US labs over the alleged misreading of her smear slides in 2009 and 2012. Mr Gleeson wrote the letter to Ms Morrissey’s consultant in 2016 in relation to the audit results on her previous smears of 2009 and 2012 and which revealed the smear tests had been reported incorrectly as negative but Ms Morrissey was told the audit results in May last year. The CervicalCheck Programme manager is being asked question about governance in particular in relation to Ms Morrissey’s 2009 and and 2012 smear slides as part of her claim for exemplary damages as well as compensatory damages. Ms Morrissey’s Counsel Patrick Treacy SC who told the court the Vicky Phelan case settled on April 25, 2018 asked the witness was it fair to say we don’t know if Ruth Morrissey ever would have found out about the smear slide audit results. Mr Gleeson replied correct and it was not an adverse incident and open disclosure required an adverse incident. It was the eighth day of the action by Ruth Morrissey and her husband Paul Morrissey of Kylemore, Schoolhouse Road, Monaleen, Co Limerick who have sued the HSE and the US laboratory Quest Diagnostics Ireland Ltd with offices at Sir John Rogerson’s Quay, Dublin along with Medlab Pathology Ltd with offices at Sandyford Business Park, Dublin 18. It is further claimed a review of the 2009 and 2012 smears took place in 2014 and 2015 with the results sent to Ms Morrissey’s treating gynaecologist in 2016, but she was not told until May 2018 of those review results which showed her smears were reported incorrectly. Mr Treacy asked Mr Gleeson about a leter Ruth Morrissey’s treating consultant with the Morrisseys wrote to him in May last year in which they asked questions about the reporting of the smear slides, when the audit results were made known and looking for feedback on the upgrading of the slides. Mr Gleeson said he did not recall seeing the letter but it was stamped as having been received on June 1 last year and passed on to the State Claims Agency legal team.